Belmond Eagle Island Lodge brings timeless luxury to the Botswana wetlands. High-ceilinged tented rooms flood with light; each has a plunge pool and oversized bed with views of the Delta. Get closer to the wildlife of this UNESCO World Heritage Site—silently glide past hippos in a traditional canoe as fish eagles soar overhead. of the Khwai River floodplains, bordering the Moremi Wildlife Reserve which allows free movement of animals within the Delta according to seasonal migrations. Khwai River floodplains are renowned for its large concentrations of mammals and is a year round destination for wildlife. Enjoy the option of safaris in either the Moremi Wildlife Reserve or the private concession where guided safari walks, helicopter safaris and evening safaris are also offered. 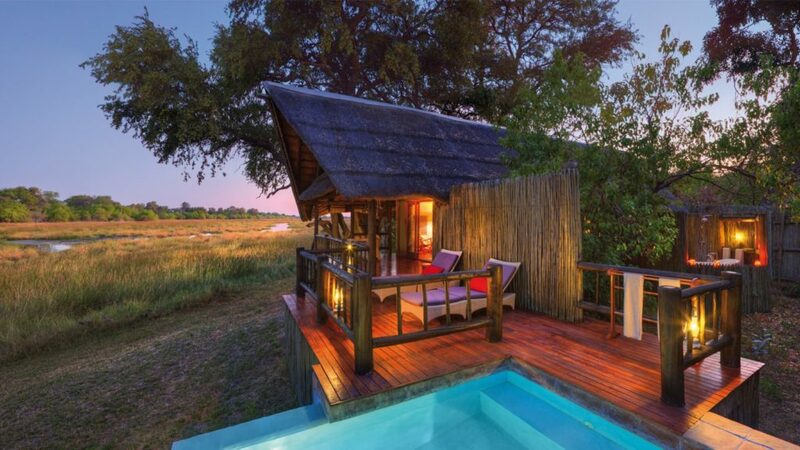 All luxury tented rooms are housed on raised wooden platforms, offering great views, and are shaded by a traditional African thatch roof. The large private decks are furnished with easy chairs and a hammock, ideal for viewing wildlife or for enjoying a dinner in complete privacy. The interiors are luxuriously appointed with such comforts as an en suite bathroom and a four poster bed complete with mosquito netting.